America’s National Parks are not only magnificent, they’re also the gatekeepers to some of the country’s most incredible stories. Whether they are accounts of visitors, untold parts of our history or tales of heroism, these landmarks are part of the fabric of who we are. And local broadcasters give you a front row seat to it all. Coming off of National Parks Week, we’ve rounded up some of the best reporting on National Parks from across the country. When massive wildfires broke out in Tennessee’s Great Smoky Mountain region, broadcasters gave community members the up-to-the minute information they needed to stay safe. WATE, a Knoxville station owned by Young Broadcasting, highlighted the efforts of Erik Cooper, a homeowner in the Great Smoky Mountains, who raced to local radio station Mix 105.5, when he realized how quickly the fire was approaching. At Mix 105.5, owned by East Tennessee Radio Group, Cooper found morning show host Jay Adams, who was at the station giving warnings to listeners. Adams gave the microphone to Cooper, who began to describe what he had seen from his house. The two stayed on air until their transmitter site lost power at 9 p.m.
“I'm just happy that Erik was able to get out and that we could get some information for people to hear," said Adams. Local broadcasters helped to support the recovery effort as well, sharing information about ways to support evacuees and those who lost their homes. And, the annual Friends Across the Mountains telethon, hosted by Sinclair’s WLOS in Asheville and TEGNA’s WBIR in Knoxville, raised a record breaking $208,000 for the Friends of the Smokies in 2017. The funds will be used to improve the park’s emergency radio system. The stations have raised more than $3.5 million since the telethon first started in 1995. The fundraiser directly benefits Friends of the Smokies, an organization that helps to fund the national park, which doesn’t charge admission. 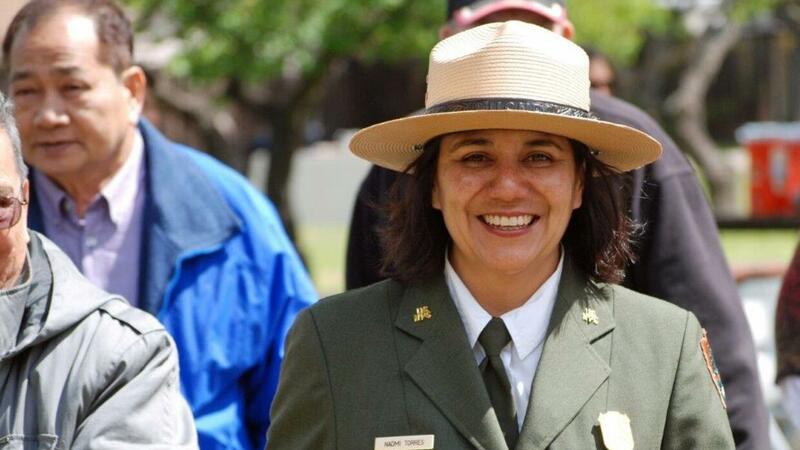 Univision profiled Naomi Torres, the superintendent of the Juan Bautista de Anza National Historic Trail, a 1,200-mile trail, stretching from Nogales, Arizona, to San Francisco, California. When Torres visited historical monuments as a child, she felt that tour guides were presenting a sanitized view of history, instead of the nuanced full story. And as a Mexican-American, she didn’t see herself reflected in the lectures they gave. Today, she works to bring in all points of view when sharing the historic trail’s story with visitors. “Throughout my career I always tried to make sure that there are other narratives besides this meta-narrative and that all the parts of the story are shared,” she said. Spokane’s KXLY, owned by Morgan Murphy Media, highlighted a $1 million donation to Mt. Rainier National Park, Olympic National Park and North Cascades National Park, made by Elizabeth Wallace’s estate. Wallace grew up in Washington State. Her bequest was the largest gift ever made to the Washington National Park Fund and will be split evenly among the three national parks in the state. Mount Rainier and Olympic National Park plan to combine their shares of the donation to purchase a computer aided dispatch system, which will help the park know where rangers are at all times. North Cascades National Park will use the funds for infrastructure improvements. “It’s what Elizabeth wanted, to give back to the parks that gave her so much,” KXLY’s Kyle Simchuk said. KTVU, a FOX owned-and-operated station in Oakland, California, reported on the remarkable tale of Alan Chow, a 36-year-old-man who spent six freezing days in Yosemite after getting lost while hiking. A park ranger found Chow after an extensive search effort. Yosemite Park Ranger Scott Gediman said Chow did everything right to survive in cold, snowy weather. More than 2.42 million American jobs depend on broadcasting, and the local broadcast radio and television industry - and the businesses that depend on it - generate $1.18 trillion annually for the nation's economy. This site is brought to you by the National Association of Broadcasters. We advocate for the nation's radio and television broadcasters.